At the end of each year, retailers leap to provide us with more containers and shelves, binders and bins to hold our great plans of a more organized space. And honestly? I LOVE them all! I can lose hours of time rearranging and organizing things. New magazine holders to store my pattern magazines? Yes, please! More shelves? 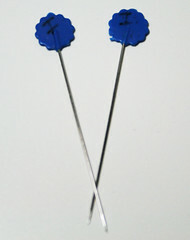 More cute cups for my seam rippers, crochet hooks and scissors? Yes, yes! 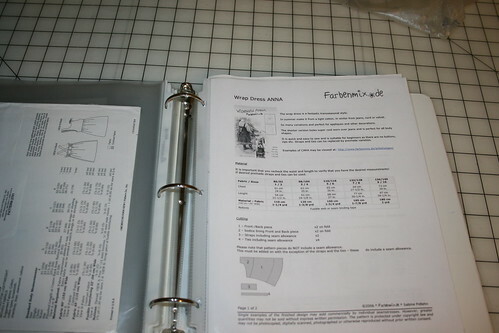 Today I’m going to share my system for organizing my sewing patterns. My pattern collection and fabric stash seem to be having a contest to see which can multiply faster. It has become obvious that I have been cheering on both sides for a long, long time. I keep my pattern envelopes separate from the actual patterns. 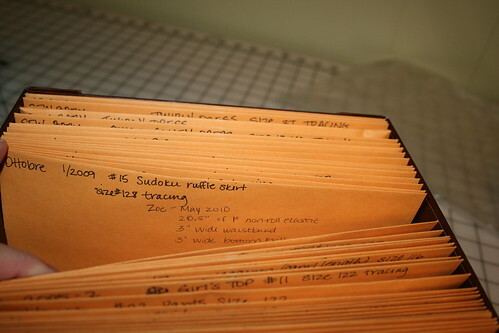 The envelopes go into a sheet protector in a binder. 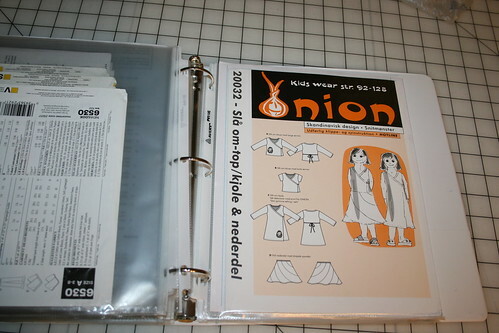 There are binders for different categories of patterns, for example, kids’ clothes, craft patterns, women’s clothes, and so on. 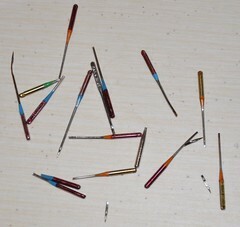 I like this method of sorting because when I’m trying to decide which pattern to use, they are all together. It’s also helpful because I can let my daughter flip through and decide what she wants. Once a decision is made, the yardage and notion requirements are right there, so I can either write it down or just grab the envelope and take it to the store if there’s something I need. 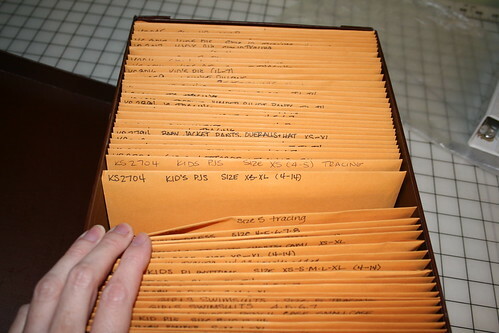 The boxes are categorized by pattern manufacturer, though another option would be to match the categories of the binders. 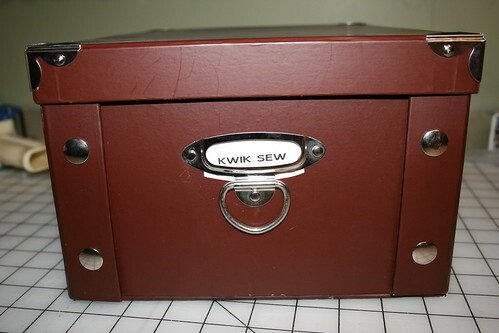 I have a box for Kwik Sew, a box for independent designers, a box for all my Butterick/McCall’s/Vogue, and so on. Depending on the size and number of pieces in the pattern, I’ll either put the tracings in with the original pattern, or use a different envelope for each size tracing. 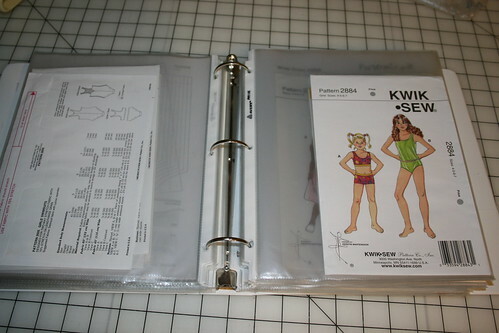 Here’s a Kwik Sew pattern where you can see the original and then the size tracing stored in the envelope behind it. 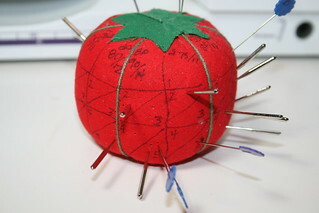 Here’s one where you can see my notes from when I used this pattern. For pattern magazines like Ottobre, I have these magazine holders from IKEA. It’s making me all twitchy to see those mismatched containers, and I’ll have to remedy that later. If you like organizing things and haven’t done your pattern collection yet, this should get you off to a good start. If you don’t like organizing but realize that you’ve now bought the same pattern multiple times because you couldn’t find your copy, dig in and do a little at a time. You can do a lot in just 15 minutes. 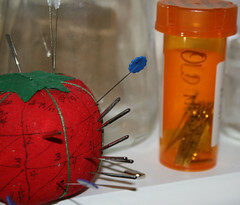 Organize for 15 minutes and then reward yourself with sewing time! How’s your pattern collection look?